Cheltenham & Gloucester plc (C&G) is a mortgage and savings provider in the United Kingdom, a subsidiary of Lloyds Banking Group. C&G specialises in mortgages and savings products. Previously, C&G was a building society, known as the Cheltenham and Gloucester Building Society. Its headquarters are in Barnwood, Gloucester, Gloucestershire, England. C&G was closed to new mortgage and savings business on 9 September 2013. The branch network of Cheltenham & Gloucester was transferred to the newly established TSB Bank plc in September 2013, as part of a divestment of a significant portion of the Lloyds TSB business by Lloyds Banking Group. 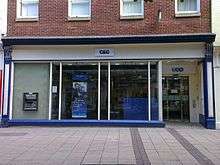 C&G branches were rebranded under the TSB brand along with a number of Lloyds TSB branches in England and Wales. Some C&G savings accounts and mortgages were also transferred to the new TSB Bank at this time with others remaining with C&G. C&G can trace its roots back to the Cheltenham & Gloucestershire Permanent Mutual Benefit Building and Investment Association in 1850. At first the Society was based in Cheltenham, its first Gloucester branch opening in 1896. Over the next 80 years, it expanded throughout the UK, opening its 100th branch in Pershore in 1979. Throughout the 1980s, C&G acquired several smaller building societies, as consolidation of the sector intensified. C&G's headquarters were at Cheltenham House in central Cheltenham up until their move to Barnwood in 1989. The then building society had commissioned a sculpture by British artist Barbara Hepworth, "Theme and Variations", which can still be seen displayed on the front of Cheltenham House. In 1984 Cotswold Building Society transferred its undertakings to C&G. This was followed by the Waltham Abbey in 1985, the Colchester, the London Permanent and the Cardiff in 1987, the Essex Equitable and the Bolton in 1988, the Bury St Edmunds in 1989, the Bedford, the Guardian, the Peckham and the Walthamstow in 1990, the Portsmouth and the Bedford Crown in 1991, and the Mid-Sussex in 1992. In 1993 C&G merged with the Heart of England Building Society. By this point it had taken over the Portsmouth, Guardian, Peckham, Walthamstow, Cardiff, Colchester, London Permanent, Bolton, Bury St Edmunds and Essex Equitable building societies. 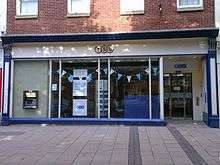 C&G converted to a bank in 1995, as result of a takeover approach from Lloyds TSB. This involved the demutualisation of the society, and generated a windfall payment to its members. In 2007 C&G was restructured and closed 31 of its 195 branches, resulting in the loss of 315 jobs. At the same time, the savings assets of Cheltenham & Gloucester plc were transferred to C&G Savings, a division of the then Lloyds TSB Bank plc. The lender for C&G mortgages also changed to Lloyds TSB Bank plc, whilst Cheltenham & Gloucester plc remained in charge of designing and administering the mortgages. On 9 June 2009, it was reported that Lloyds Banking Group were to close Cheltenham & Gloucester's 164 branches in November of that year, at the cost of around 1,660 jobs. Lloyds stated that the C&G brand name would be retained for mortgages and savings, while customers could use any branch of Lloyds TSB to access their accounts. However, on 19 August 2009, Lloyds announced that it was to review this decision. 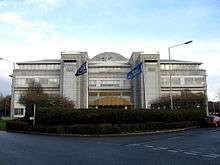 C&G had its own staff association which represented members of staff in the building society for collective bargaining purposes and individual members of the staff association for disciplinary and grievance purposes. In 2004 the staff association merged with the trade union Amicus, retaining its own 'C&GSA' branding until Amicus merged with the TGWU in 2007 to form Unite. Speculation had arisen that Lloyds was to sell off C&G, after the European Commission demanded in late 2009 that both it and Royal Bank of Scotland sell off existing branches in order to safeguard competition concerns, following their respective bail-outs by the UK government. Lloyds announced the creation of Project Verde in November 2009. In July 2012, it was announced that all of the C&G branches along with some Lloyds TSB branches would be sold to The Co-operative Bank and rebranded as TSB. However, in April 2013 the Co-operative Bank decided not to proceed with the acquisition citing the economic downturn and tougher regulatory environment imposed on banks. Lloyds Banking Group confirmed that the rebranding to TSB would still take place. The new TSB Bank was launched on 9 September 2013 and all Cheltenham & Gloucester branches were rebranded TSB on this date. The new bank was divested from Lloyds Banking Group in 2014, through a stock market flotation and was acquired by Sabadell Group in July 2015. On 13 June 2013 the Treasury Select Committee announced an inquiry into the required divestment of the Verde branches and the collapsed bid from The Co-operative Bank. As of December 2013, the inquiry is still ongoing. As a result of the formation of the new TSB Bank, C&G no longer has any branches, and does not provide new mortgages or savings products to any customers. Retained C&G mortgages are administered by Cheltenham and Gloucester plc and are provided by Lloyds Bank plc. Retained savings accounts are held with C&G Savings, a trading division of Lloyds Bank plc. Following the transfer of all C&G branches to TSB Bank plc, C&G products can be serviced at Lloyds Bank branches, by phone or by post. ↑ "How to apply". Retrieved 2013-12-10. ↑ "TSB is back on the high street". Cheltglos.co.uk. Retrieved 2013-10-15. ↑ "The Citizen and Gloucestershire Echo - 23/06/2009 digital edition". Edition.pagesuite-professional.co.uk. 2009-06-23. Retrieved 2013-10-15. ↑ "Theme and Variations". Barbara Hepworth. Retrieved 2013-10-15. ↑ Rex, Simon (2013-07-01). "Building society mergers and conversions since 1980". Building Societies Association. Retrieved 2013-12-01. ↑ Goldsmith, Vivien (1993-05-06). "C&G to merge with Heart of England". The Independent. Retrieved 2013-12-01. ↑ The C&G: A brief history (2009-06-09). "Gloucestershire - Credit Crunch - The C&G: A brief history". BBC. Retrieved 2013-10-15. ↑ Ferreira-Marques, Clara (2007-08-08). "UK's Lloyds TSB cuts jobs as 31 C&G branches close". Reuters. Retrieved 2013-12-02. ↑ Jones, Alan (2009-06-09). "Lloyds branded a 'disgrace' for C&G branch closures - Business News - Business". The Independent. Retrieved 2013-10-15. ↑ "Business | Lloyds closing all C&G branches". BBC News. 2009-06-09. Retrieved 2013-10-15. ↑ "Business | Lloyds to 'review' closure of C&G". BBC News. 2009-08-19. Retrieved 2013-10-15. ↑ "Extract from BSA Yearbook 2013/14 - Mergers and Name Changes" (PDF). Building Societies Association. 2013-10-04. Archived from the original (PDF) on 2013-11-09. Retrieved 2013-12-02. ↑ "Cheltenham & Gloucester PLC History". FundingUniverse. Retrieved 2013-12-02. ↑ "Finance and Legal - history". Unite the Union. Retrieved 8 October 2015. ↑ "Business | RBS and Lloyds set for sell-offs". BBC News. 2009-11-03. Retrieved 2013-10-15. ↑ "Archived copy" (PDF). Archived from the original (PDF) on 2014-09-12. Retrieved 2013-12-11. ↑ "BBC News - Q&A: Co-op buys Lloyds TSB branches". Bbc.co.uk. 2012-07-19. Retrieved 2013-10-15. ↑ "Lloyds' branch sale to Co-op falls through". BBC News. 2013-04-24. Retrieved 2013-04-24. ↑ "Inquiry into Project Verde set to begin". Insolvency News. 2013-06-13. Retrieved 2013-12-11. ↑ "Project Verde". UK Parliament. Retrieved 2013-12-11. ↑ "Mortgages and savings from Cheltenham & Gloucester | C&G". Cheltglos.co.uk. 2013-09-10. Retrieved 2013-10-15. ↑ "How you contact us". Cheltglos.co.uk. 2013-09-09. Retrieved 2013-10-15.